The Advertising Standards Authority has banned a poster by the e-cigarette company Nicofresh after complaints that it was offensive on the grounds of race and age. The billboard poster, which appeared in various locations in Belfast and was created by Bloom, featured an elderly white woman sitting on a sofa alongside a young black man. The man had his arms around the woman, while she held an electronic cigarette. 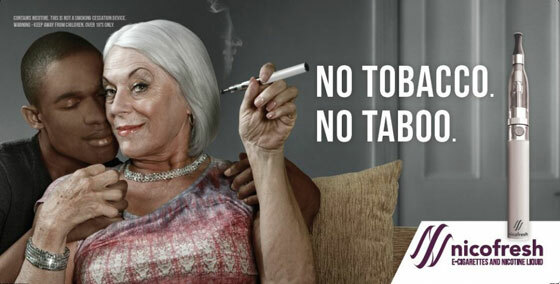 Text alongside the image stated: "No tobacco. No taboo." Six complainants challenged whether the ad was offensive on the grounds of race, because it implied that an interracial relationship was socially unacceptable. Four of the complainants also challenged whether the ad was offensive on the grounds of age, because it implied that a relationship between an elderly woman and a younger man was socially unacceptable. 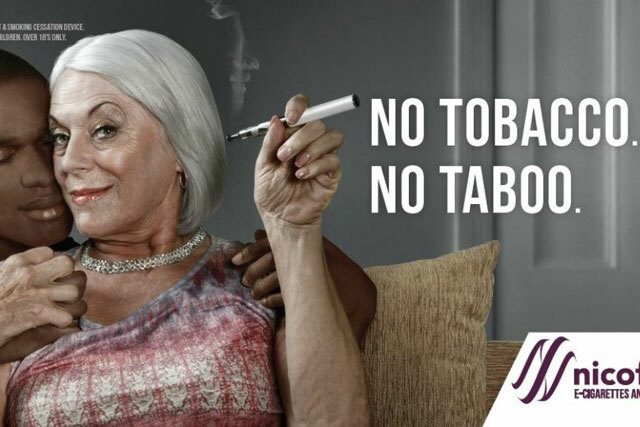 The ASA found that consumers viewing the ad would believe it was presenting a relationship between an older and younger individual, particularly an older woman and a younger man, and a couple of different races, as something that was unusual or socially unacceptable. Therefore, the ASA upheld the complaints, ruling that it "was likely to cause serious or widespread offence on the grounds of race and age". The ad cannot appear again in its current form and the ASA has warned Nicofresh to make sure its ads are not likely to cause serious and widespread offence, and to be particularly careful around the issues of race and age.